Volumes are the Block Storage devices that you attach to instances to enable persistent storage. Users can attach a volume to a running instance or detach a volume and attach it to another instance at any time. For information about using the dashboard to create and manage volumes as an end user, see the OpenStack End User Guide. As an administrative user, you can manage volumes and volume types for users in various projects. You can create and delete volume types, and you can view and delete volumes. Note that a volume can be encrypted by using the steps outlined below. On the Admin tab, open the Volume tab. Click the Volume Types tab, and click Create Volume Type button. In the Create Volume Type window, enter a name for the volume type. Click Create Volume Type button to confirm your changes. A message indicates whether the action succeeded. Create a volume type using the steps above for Create a volume type. 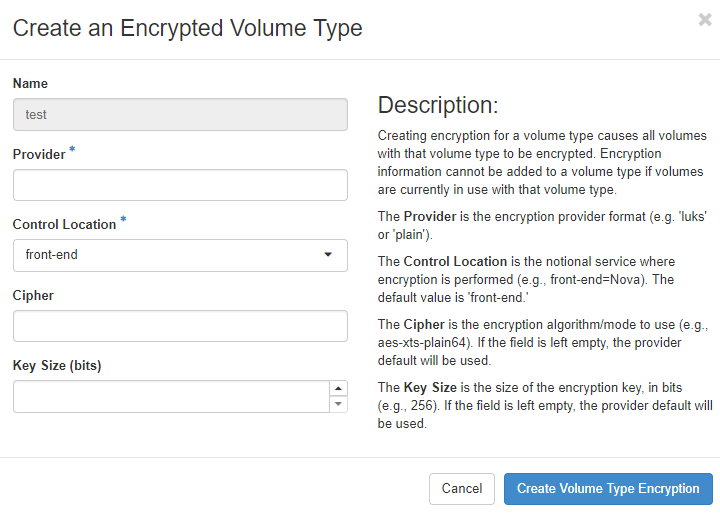 Click Create Encryption in the Actions column of the newly created volume type. Specifies the encryption provider format. Specifies whether the encryption is from the front end (nova) or the back end (cinder). Specifies the encryption key size. The table below provides a few alternatives available for creating encrypted volumes. To see further information and CLI instructions, see Create an encrypted volume type in the OpenStack Block Storage Configuration Guide. When you delete a volume type, volumes of that type are not deleted. Click the Volume Types tab, select the volume type or types that you want to delete. Click Delete Volume Types button. In the Confirm Delete Volume Types window, click the Delete Volume Types button to confirm the action. When you delete an instance, the data of its attached volumes is not destroyed. Click the Volumes tab, Select the volume or volumes that you want to delete. In the Confirm Delete Volumes window, click the Delete Volumes button to confirm the action.